Lawyers primarily focus on the task at hand and getting results, leaving little room for camaraderie and support. When a lawyer’s connection with team members is positive, it creates a shared work ethic and belief that the firm’s work is worthwhile. Failure to do so will create inefficiencies and disharmony in the firm, and thus poor client relations. Maintaining communication within the law firm team is a lawyer’s number one practice responsibility. Everyone in a law firm – lawyers, staff and support personnel – should be committed to a team effort for providing the best possible client service. Clients ultimately get their understanding of a firm by the way in which everyone, lawyers and staff, conducts themselves. A successful law office or law firm should be a team that creates quality service and work product for the benefit of clients. A communication effort that supports an emotional commitment to the success of the firm, can lead directly to the ideas of value billing and client service, as an antidote to simply focusing on billable hours and ignoring the worth of what each person does. 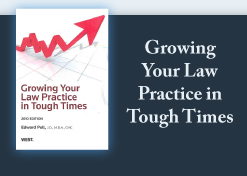 It takes the law firm out of the realm of industries like autos and banking, where churning out cars and mortgages without regard to value and worth led to overshoot, collapse and layoffs. The automotive manufacturer that once was the largest company in the world ended up in bankruptcy because it did not listen to its customers or its employees. Law firms, small and large, are all subject to the same need for communication that is open, candid and frequent. Failure to maintain consensus and communication merely causes poor economic results and unhappy members of the law firm. If all members of the firm are not clear about the overall goals as well as specific objectives and strategies, there is no real firm leadership – and ultimately there may be no firm. Many people have asked what is the one single most significant element of success. In my opinion, the single most important element is persistence. I remember thinking a number of years ago about this in considering the successes of my daughter. Then, I called it "sit power." The ability to sit in your seat and study for your exams will always carry you over the person with natural talent but little persistence or consistency. Preparing for trial or writing a legal brief requires the same type of effort. Said another way, it's the story of the tortoise and the hare. My father also suggested another approach. There are 365 days a year, 24 hours in a day. If you think of this as a whole, rather than 9 to 5 on a daily basis, you'll be able to do what needs to be done without reference to the clock and usually have a more balanced life, though any single day may not be "balanced." Persistence in law also means good communication. If you stay by the phone, an easier thing to do with today's technology, you'll be able to respond to your public when they need you.